Virtual History Roma presents a fantastic voyage to Ancient Rome, the capital of the largest empire in the ancient world, which has been reconstructed in virtual form and which you can explore in a “full-immersion” panoramic experience. 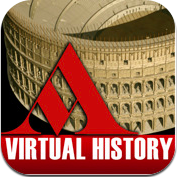 This app allows you to fully appreciate the building construction, scale and atmosphere that was Ancient Rome. At the higher end of the app market at $10.99 AU it is a bit expensive but it certain has the capacity to entice students into the ancient world. The Roma app format provides the viewer with an astonishing insight into Roman civilization, using innovative functions and multimedia content: from the spectacular digital reconstruction of the city's statues to breathtaking aerial views of the metropolis as it stood 2,000 years ago. The reconstruction of their original appearance, as seen from various angles, is overlaid and compared with their appearance in today’s Rome. 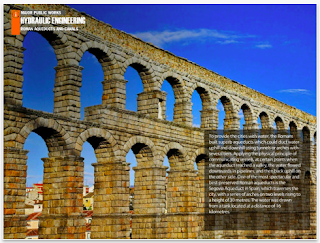 Maps and introductory data sheets make it possible to make an in-depth study of the origins of Rome, its conquests and the fall of the empire, the Romans’ extraordinary engineering feats, art, wars and public spectacles, profiles of the various emperors, and you can discover how much of Roman civilization has survived to the present day. The Roma virtual tour proceeds south to Pompeii, Ercolano and other important Roman cities – in Europe and the Mediterranean – which are all presented with 3D models, information pages and hundreds of superb quality images. No more photocopies, no more static images, get your students to know what it feels like to walk the cobbled streets of Rome or Pompeii. Set your students places, objects or buildings to locate. These can be linked back to significant sites that you need to cover in your syllabus. Take some time and create quest like activities to use with these simulations. You could even set up activities to incorporating principles of Game Based Learning. Students must move from one level to the next, students can earn badges etc. Better still get the students to develop quest activities. This could even be a chance to incorporate the use of QR codes with your class. When the students find the answer to one of the quest questions they get access to the next piece of source material via QR code. This would also be a great opportunity to involve students in the writing of their own units. This interaction in the learning process will provide motivation for your students - giving them ownership of each of the activities. Maybe just allow them to design and negotiate certain tasks. This APP looks well worth the price. I wish you great success. This looks amazing. However, the real question, in my opinion, is do appropriate lessons exist to help students interact with it in meaningful ways?